A wide range of startup, commercial and industrial heat press machines for new companies, small businesses and industrial operations – High quality heat presses from Stahls and Stahls’ Hotronix allow for every budget and business requirement. A heat press is an electrical machine which is used to heat apply designs onto substrates, using a combination of the heated upper platen and consistent pressure of the downward force onto the lower platen for a specific amount of time which is variable upon the particular process and also the material being applied onto. Heat presses are most often used to apply designs onto garment fabrics, such as t-shirts, hoodies and polo shirts, but there are also specialist presses which can be used to heat press onto other products such as caps, sports balls and mugs. Using a heat press machine to apply heat transfers based on plastisol inks, Heat Transfer Vinyl or Printable HTV designs to fabric is now one of the most commonly used methods for printing garments, rather than the other methods such as DTG, sublimation and silk-screen printing. 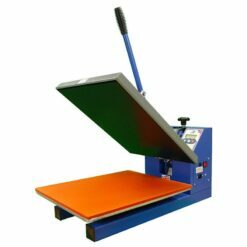 This is an integral piece of equipment to any printing business and there are also different types of heat press machines available. In addition, the budget you have available to spend on a heat press will also be a factor in which type you buy. What type of heat press machine is right for me? Clam: This style of heat press machine is a compact design which is by far the most common, and has a heated upper platen directly over the lower platen and the garment or substrate is threaded onto the lower platen for heat pressing. Draw: This type of heat press has all the functions of the clam with the added advantage of the lower platen being able to slide (or “draw” out) from the heat press machine whilst the upper platen is fixed horizontally. This means that the lower platen can be moved away from the heat of the upper platen for easier and safer threading of the garment on and off the lower platen. Swing-Away: This type of heat press has all the functions of the clam with the added advantage of the upper platen swinging away from the lower platen which is also safer for the press operator than a regular clam press. However due to the swing of the upper platen more work space is required for this style of heat press. Stahls’ Clam Basic Heat Presses: These are entry-level clam heat presses which are competitively priced and built in China but to the high standard that customers demand from Stahls’ products. Stahls Hotronix MAXX Heat Presses: These are mid-level clam heat presses which are proudly built in the USA by Hotronix and are of exceptional quality. Stahls Hotronix Auto-Open Heat Presses: Like the MAXX press, these clam presses are also built in the USA, but have the additional features of a pressure sensor and an auto-release magnet which raises the upper platen automatically once the predetermined time has elapsed. Stahls Hotronix Fusion IQ Heat Presses: These are top-level heat presses which are built in the USA and are of the highest quality – They have several features to make high-demand printing quicker and easier, along with cloud-based press operator reports. The standard Fusion IQ heat press has both draw and swing-away options, but there are all pneumatic versions available which are swing-away presses. All of the Hotronix heat presses that we supply also have quick-release interchangeable lower platens available to purchase separately to aide companies in heat-applying onto more difficult items or garment areas – For more details, visit the Hotronix Lower Platens section of our site. The three main requirements to successfully apply a transfer are an accurate temperature, time and pressure. A heat press can be calibrated to these requirements and maximise your efficiency, whereas you will not be able to perform anything accurately with a domestic iron. Additional lower heat press platens: All of our Hotronix heat presses have a variety of different shapes and sizes of lower platens which make the placing and applying onto garments much easier. For example, printing a child’s garment on a 40x50cm heat press is much easier with a 15x25cm lower platen. There are lots of other accessories available, all of which can be seen in the Accessories section of our site. Why buy a heat press from us? Regardless of the heat press you choose, you should always ensure that the company that supplies it offers a comprehensive warranty and can supply any parts that you may require in the future. We can repair and maintain all of the heat presses we supply to give you the technical support and advice that you require, based on over 30 years of trading in the heat transfer industry.